I hope the council committee approves these proposals. It’s a shame that motorists couldn’t be community-minded or considerate enough to avoid having to implement them, but that’s the way it is. The historic family homes at 291 and 292 Hills Road may be about to get demolished. On Sunday afternoon, neighbours and other local residents will be gathering outside 292 Hills Road to celebrate its distinguished history. Here are my thoughts on the Cambridge South East Transport project. It seems to me that the authorities consider this to be more about the people out in the countryside who they want to get into and out of Queen Edith’s more quickly. We need to make sure that our voices are heard. Is A Busway To Queen Edith’s Coming Down The Road? The authorities reckon they can solve congestion coming into Queen Edith’s by building a new Park & Ride, right out at the A11, the other side of Babraham, then creating a bus service from there which will be good enough to get people out of their cars. This will have a big impact on us for many years to come, but they’ve only given us a few weeks to work out what it all means and have our say. Here’s everything I know, and what we can all do. A surprise proposed new section of double yellow lines has been unveiled by the county council for the stretch of Baldock Way between Blinco Grove and Cavendish Avenue. This may be of interest to you if you’re of strong constitution when it comes to reading administrative documentation, and are concerned about subjects including the Wort’s Causeway development, cycle parking, on-street deliveries, tall buildings, parking stress, traveller sites, student accommodation, access to the railway station, and more. Grab a coffee and read on. Several of these local developments will be coming up at this month’s City Council Planning Committee meeting on Wednesday 10 January. Initial proposals have been announced for 1200 houses and flats on what’s called “land north of Cherry Hinton”, but which in reality is the southern part of the Cambridge Airport site. The County Council is planning to put yellow lines in Netherhall Way, Chalk Grove and Beaumont Road. Our current County Councillor – Amanda Taylor – was elected in 2013, and she is standing for re-election. There are several issues which make the result rather uncertain however, which I discuss in this third part of my election guide. Sitting here in Queen Edith’s, I can’t muster up any enthusiasm for this election. Here’s why. An unloading ban on Hills Road? Who knew? Residents who object to the plan have just a few days to email the council with their views, and no suggestion that what they say will have any effect. Each year the County Council funds road improvement schemes up to £10,000, and a whole range of proposals in Queen Edith’s have been given the go-ahead. Under a council plan, the whole city will eventually get the chance to implement residents parking schemes. Here are the details, as well as the latest from the Morley Residents Parking Scheme. Unfortunately, many were unnecessarily disappointed. A couple asked me if they’d missed the presentation, so I had to explain that there wasn’t a spoken ‘presentation’, they were just supposed to look at the engineering drawings on the display boards and the rest was up to them. Sam Davies from the Queen Edith’s Community Forum said that it is very clear that the best we can do has been to ask them to look again what seemed to us to be the most dangerous elements of the design, while also urging the County Council to live up to commitments previously made on finishing off Phase 1, including completing the review of that work; and to deliver an acceptable public realm. 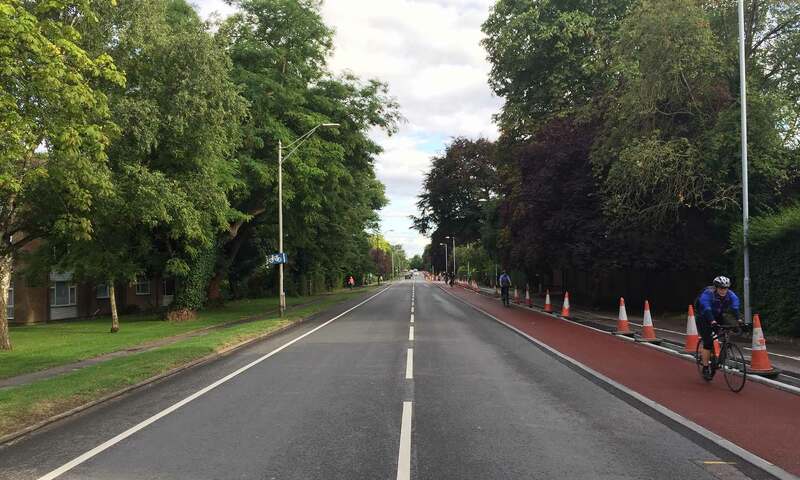 Cycle Lanes To Addenbrookes: Who’s In Charge Here? Surely the Council officers work for us, and we elect Councillors to tell them what to do. But it seems to be that salaried County Council officers think they can do what they like. A look ahead to the new year in Queen Edith’s ,and a chance for me to thank those people who represent us in government and our local authorities: it’s a largely thankless task, but it shouldn’t be. At the start of the 20th century, most of Queen Edith’s was countryside. The north-western corner around Rock Road was the only real built-up area. Over a hundred years later, much of the area is showing the strain of its vintage. In this last of my five part series on the streets and transport, I’d like to bring you an update on where we are with the City Deal, because things have changed even since Monday. Thursday evening saw a meeting of the City Deal ‘Executive Board’, and the main item on the agenda was to decide on the next stage of the “A428 Cambourne to Cambridge Better Bus Journeys” scheme. Bear with me if you think this hasn’t got much to do with Queen Edith’s. As I mentioned before, they’ll be turning their attention to the A1307 Babraham Road soon, so forewarned is forearmed. In a City with such skills, abilities and wealth at hand, a practical futuristic vision should be deliverable. Tim Moore explains. Was there ever an initiative in Cambridge that united so many disparate groups of people against it, for so many different reasons? Ever thought you’d like to see improvements to local streets, and said to yourself: “We’d chip in towards that ourselves if we had the chance”? Actually, you can. Get ready for five daily blogs on transport this week, starting with this personal view of what the City Deal is trying to do. It’s not very encouraging so far. But see what you think. I don’t think many people are aware of how much building and development is brewing in our area. Two events in the next fortnight will shed light on what’s happening. Today the council published plans for cycle lanes on Queen Edith’s Way, including one idea which transplants the grass verge by the houses to separate the pavement and cycle lane. There’s also a plan for an innovative replacement layout for the Fendon Road/Queen Edith’s Way roundabout. Going out of the city, traffic will soon be invited to speed up just as it approaches Cherry Hinton Hall Park and the alleyway opposite, an area where children are frequently crossing. In the latest example of “Quick – there’s a space – let’s build on it!”, competing parties have their eyes on the plaza in the centre of the Leisure Park. First out of the blocks, in the black corner, are the owners of the site, X-Leisure (themselves owned by Land Securities), who want to build a new restaurant building between the Travelodge and The Light Cinema. Let’s sort out the parking, shall we? Smarter Cambridge Transport is asking for a six-month trial of city-wide neighbourhood parking schemes, allowing local communities to choose the most suitable parking controls for each area. Support its request by signing the petition at the Cambridgeshire County Council website. Monday night’s council “South Area Committee” meeting heard what the Cambridge News described as a “blistering attack” on many local transport initiatives by Stagecoach bus chief Andy Campbell. Residents’ Parking for the north-west of Queen Edith’s? Car parking is a growing problem in several parts of Queen Edith’s, most notably in the roads nearest to Addenbrooke’s and in the roads opposite Hills Road Sixth Form College. In Rathmore Road, Hartington Grove, Marshall Road and Blinco Grove, pavements are regularly blocked and gridlock can ensue as two-way traffic tries to fit into a single carriageway. One solution might be a residents’ parking scheme. Can we fix the Long Road/Hills Road junction for everyone? As part of the Greater Cambridge City Deal, this junction is being examined for improvements, and the views of residents and users are being sought. Our streetlights may remain on overnight, after the city council has stepped in and proposed to cover the cost. We may not have a village centre, or signs naming our part of the city, and we may not even be represented by the city’s MP, but I’d like to think Queen Edith’s is steadily continuing to develop more of a character as it grows in importance. The County Council’s has granted us a consultation survey on the proposed streetlight switch-off. But there are still many questions to be answered, and many serious objections to the plan. This is an exciting time in the development of our city, and if you’d like to take part, there are opportunities to do so. Cambridgeshire County Council seems determined to press ahead with its plan to turn off the county’s streetlights after midnight. Here’s what residents were told at Monday night’s City Council South Area Committee meeting. It was probably the best-attended South Area Committee meeting for a long time. Here’s what the council officer and contractors had to tell local residents about the cycleway saga. The first ever Queen Edith’s Community Action Morning was considered a big success. Here are some photos! Developers targeting Worts’ Causeway. Have your say. A small, single storey house on Worts’ Causeway has been bought by a local property developer and plans submitted to replace it with two 4-bedroomed, 3-storey houses. Following a letter from government inspectors questioning council plans, local residents are being urged to contact the council leader. We often complain that major works like this are progressed without talking to the residents, so the council should be congratulated on holding a well-publicised consultation on this one. The Boundary Commission has suggested new ward boundaries for the city which will radically reshape Queen Edith’s with respect to the county council. Queen Edith’s has a pub again! The brand new “Queen Edith” public house in Wulfstan Way opened for business this Friday lunchtime. Mrs R and I were amongst the first at the bar. Our local newsletter has been given a grant to continue. Now, if we can get advertising from local businesses, we can make the issues more extensive. I’m amazed, especially with an election taking place, that the plan to switch off streetlights at night has not been a bigger issue. The original plan has been completely revised, and the feeling is that the new design, as approved, will be better for both cyclists and pedestrians. Addenbrooke’s roundabout handles a massive amount of traffic, yet has to cater for some of the most vulnerable members of society. If you’re a Queen Edith’s resident, over the next few days you should be getting the relaunched issue of “Queen Edith’s Community News” through your letterbox. Here’s why I’m rather excited about this.